If there’s ever a Breakfast at Tiffany’s film reboot, actress Olivia Wilde should definitely audition. Not only does she have the look of Audrey Hepburn, who plays Holly Golightly in the 1961 version, but she’s also got a profound adoration for the American jewelry brand. 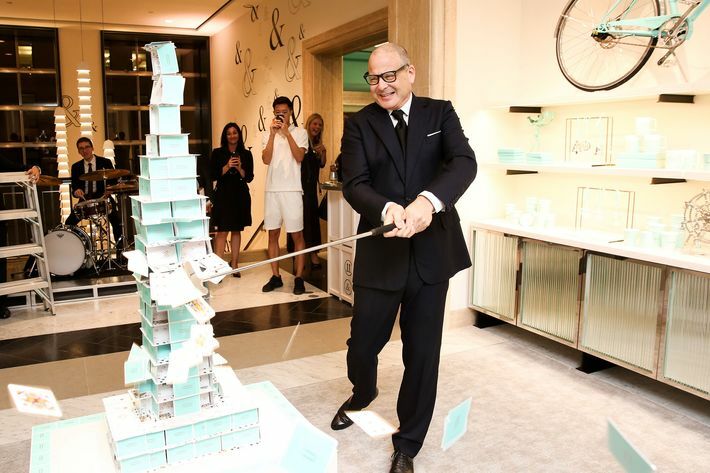 “For me, the brand is very much connected to romantic nostalgia; family; gifts from my grandmother and my mother,” Wilde gushed on Wednesday night at the grand opening of the new Tiffany’s Blue Box Café. Actress Riley Keough — another strong Golightly contender — was also in attendance, along with influencers Garance Doré, Aimee Song, and Charlotte Groeneveld. Today, unlike 56 years ago, a modern Ms. Golightly can actually enjoy a sit-down meal at the Fifth Avenue Tiffany store, as opposed to coffee and a croissant on the sidewalk in front of it. In addition to a fully functioning restaurant, the renovated fourth floor also houses Tiffany’s new home and accessories collection by Reed Krakoff, which includes everything from a now-infamous $1,000 tin can to bronze silly straws and baby accessories. “A witty take on luxury” is how Mr. Krakoff described it. The fourth floor at Tiffany is filled to the brim with everlasting objects that comply with the Olivia Wilde Guide to Memorable Gift Giving. (As well as a chance to make some “real” memories over breakfast.) So many objects, in fact, that when I asked Wilde what was missing from the collection, she was genuinely stumped. As I got up to leave, however, Wilde came running over with an idea, tapping me on the shoulder. And with that, she joined the party. media 4/24/2019 at 5:41 p.m.